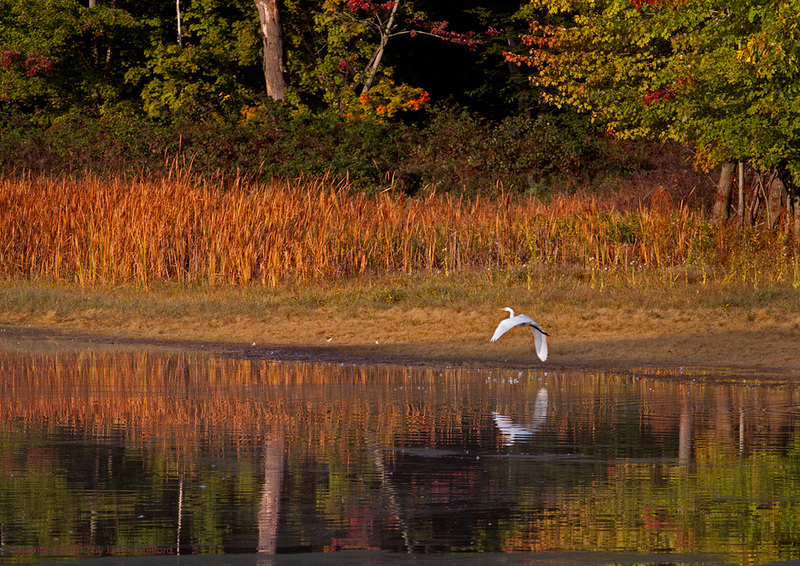 A Great Egret floats over still water and amid fall foliage illuminated by early light. This morning I had a little extra time so I paid an early visit to the Strongsville (Ohio) Wildlife Area of Cleveland Metroparks. The air was unmoving and chilly but the morning light was warm. On the lake floated ducks and wading along the far shore was the resident Great Egret. I’d seen the big white bird there before and was hoping to spy it once again. I shot a good many images of the bird as it waded along the shallows, striking into the water now and again, feeding on small aquatic creatures. A hawk landed high in a neighboring tree and, after sitting there for a bit, took off. I don’t know if it was the raptor’s activity or if the egret spotted me but it sprang into flight. I squeezed off a few shots as the bird slowly flew farther along the shoreline; shown here is the best of the bunch. A little farther down the road I encountered a young buck Whitetail Deer who was apparently waiting to cross. I stopped to allow it to make up its mind. On the seat beside me was my trusty camera so, as the deer started moving, I fired off a few shots; unlike the other kind of shots, the youngster has been preserved by mine. It was a happy morning. UPDATE: One week after I made the photo of the deer, I noted Cleveland Metroparks had closed the section of parkway where the encounter took place. The road block signs didn’t say it but it looked like the area was closed for wildlife “management.” Too bad the only way they seem to be able to manage wildlife involves rifles. 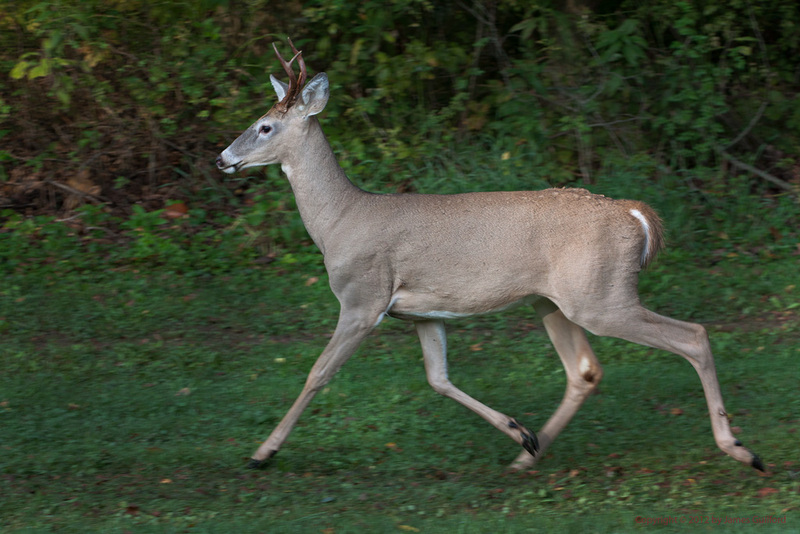 A young buck Whitetail Deer trots along at the edge of the woods.